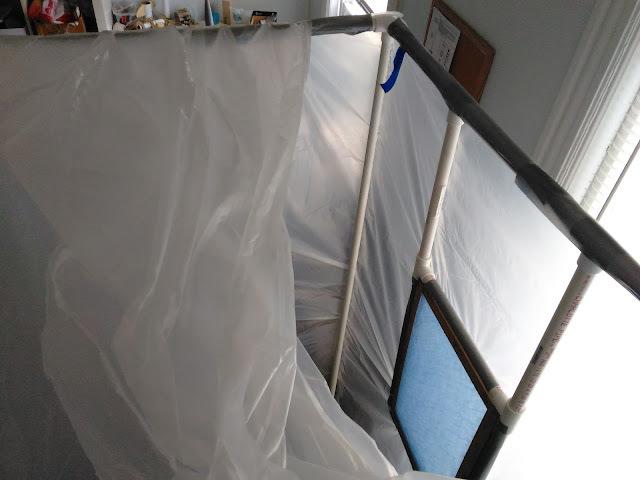 After toying with the idea for a long time, I have built an indoor spray painting booth, so that I can have a place to paint rockets when I want to. The area outside the house in which my apartment is located has little space for spray painting, and the North Atlantic coast tends to be too windy on most days. Good spray painting weather is hard to come by here. I built an indoor booth last year, and while I did get some beautiful paint jobs with it, the design I came up with was potentially dangerous, so I never posted it here. Finally, I have finished an indoor booth with which I can safely paint inside my apartment. And it's large enough for most projects. A full build and post will be forthcoming. For now, though, here's Part 1 of the four-part video series I have shot on the booth. This is a continuation of a series on model rocket stability for beginners. Click here to go to the beginning of the series. Click here to go to the last post. Each year, since 1958, the National Association of Rocketry holds an event called NARAM - the NAR's Annual Meet. This is a large competition, with fly offs for things like altitude, duration (how long a rocket can stay in the air on a parachute or streamer), scale modeling, craftsmanship, etc. There's also a Research and Development competition, or R&D. Competitors present research projects into some aspect of model rocketry they've been examining. Research topics can be very basic or pretty esoteric. They may be focused on a highly technical aspect of rocketry, or perhaps on the craft of rocket building. An R&D project might examine some very specific problem only of interest to competition rocketeers, - for example, the effect of a piston launch pads in altitude competitions, or new exotic building materials for boost wing gliders - while others are more general and concern issues many modelers face. 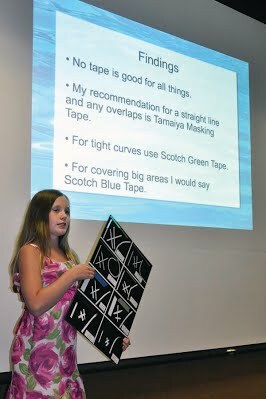 A rocketeer presents her R&D report. NAR R&D reports have added much to the knowledge base of model rocketeers and expanded our horizons. While some reports are of interest to only a few people, there are others which really make a large impact on the hobby. In the next couple of posts, we're going to discuss the one research project that has probably benefited every single rocketeer since it's submission in 1966. In the early days of model rocketry, as we've discussed in the previous posts, rocketeers ensured that their designs would be stable by using a somewhat crude but effective method using a two-dimensional cutout drawing of their designs. By balancing the cutout, the center of lateral area could be found, which was also what the center of pressure would be if the rocket were flying at an angle of attack of 90 degrees - sideways into the wind, in other words. We also saw hints, through the pictures, that the true center of pressure during flight is in fact far aft of what the cutout method indicated. But if the cutout method worked, why bother with a different method? It may have been crude, sure, but it worked, and the rockets resulting from its use were stable, so what's the problem? And how do we know where the true Center of Pressure is, anyway? Well, it turns out that the engine driving the search for a new method of determining CP was competition. Specifically, NAR competition rocketry. While a model built using the cutout method is certainly stable, it is actually quite unlikely to fly as high as it might. There are three main reasons why: weight, drag, and weathercocking. The cutout method shows the hypothetical center of pressure much further forward than it actually is. 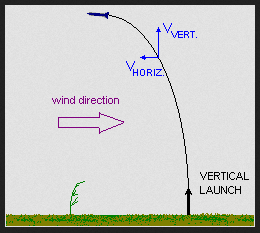 In our illustration, using a quickly designed model - Sounder IB - we saw that while the Center of Gravity (CG) was a ahead of the CP in our simulated design and the rocket would therefore be stable, if I'd simply used the cutout method, the CP would have seemed to be so far forward that it was ahead of the CG. If all I had to go on for finding the CP was the cutout method, I'd worry the rocket would be unstable, and I'd have to modify the design. One way to fix this would be to shift the CG forward, until it was at least one body tube diameter (or caliber) ahead of the CP. To do this, I'd need to add some weight to the nose end of the rocket. I could do this a number of ways. If I had a plastic nose cone, I could stuff it with clay and ram it into place with a dowel rod until the rocket balanced where I wanted it to. (If you have built certain Estes kits, you may be familiar with this method). With a balsa nose cone, I might drill a hole in the shoulder of the nose cone, and fill the hole with either clay or fishing weights, and then some glue to keep everything in place. a little over 100 feet. If this were a competition model, those extra feet could make a big difference. The point is that in order to know my rocket would be stable, I'd have to add a significant amount of weight to the rocket - probably 10 grams or more - and with a rocket as small as Sounder IB, that would add up to a significant weight gain - and altitude loss. Increasing the size of the fins would, though. I'd have to make a new drawing with larger fins, cut that out, find the new CP, and hope the CG of the finished model would be forward of that. aerodynamic drag would again cost the rocket over 100 feet in altitude. Using larger fins creates more drag, or wind resistance (as does adding more fins). Drag can be a powerful force which tries to stop a rocket in flight. Because of that, a rocket with larger fins will not fly as high as one with smaller fins. All model rockets will tend to arc into the wind somewhat. Some do it only a little, and fly mostly straight until they get near apogee, when the rocket is slowing down, and then arcs into the wind. Other rockets arc into the wind much more, so that flights are rarely straight up, and more often form a large bow in the sky. This phenomenon is known as weathercocking, and is caused by the same things which make the rocket stable in the first place. As a rocket flies upward, its angle of attack is near zero degrees. But in reality, it's never completely zero degrees. Crosswinds flowing parallel to the ground combine with the apparent wind coming directly nose-on to the rocket. If a rocket is flying 200 miles per hour upwards, and the wind is only, say 10 miles per hour from the east, you might think the wind felt by the rocket from the front would overwhelm the wind coming from the side, and the rocket would only experience wind from straight ahead. The rocket may oscillate back and forth as it stabilizes itself, but generally it's only going to feel wind coming from one direction - upwards. In fact, a consistent, light breeze from one direction will combine with the wind from the front, and as the rocket oscillates back and forth, it will tend to curve into the wind. This happens to some degree with most rockets on most flights. However, it's more apparent on 1) really windy days, or with 2) slow-lifting rockets, or on 3) overstable rockets. 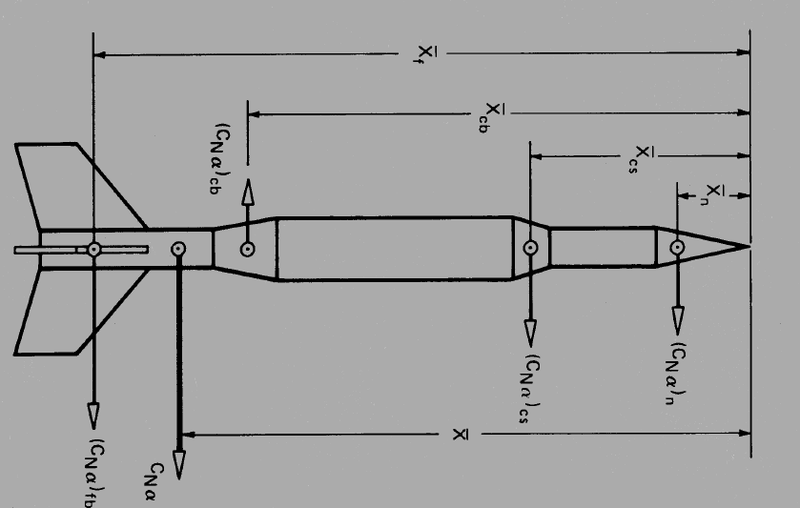 In Part 4, we mentioned that the ideal static margin of stability is 1-2 caliber. A higher caliber of stability is usually OK, but it will lead to more weathercocking. Why? Think of a rocket as a lever. The Center of Gravity is the fulcrum. The CP is where you grab the lever to do the lifting. If you have a short lever, it's harder to lift things with it. But a longer distance between your hand and the fulcrum means it takes less force to move the lever. 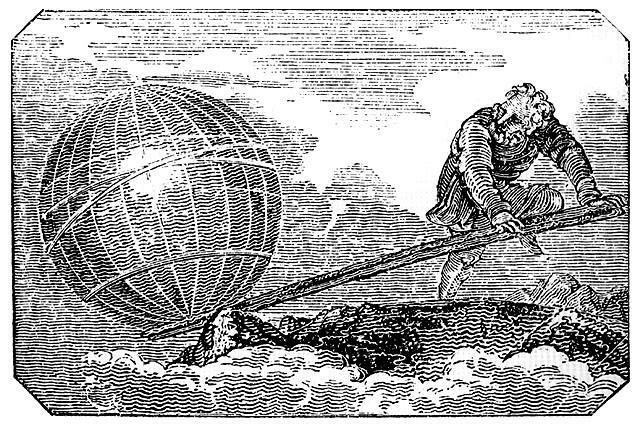 Archimedes claimed that with a long enough lever and a place to stand, he could move the Earth. So a rocket with a longer distance between the CG and CP means it takes a lot less force for the wind at a slight angle of attack to cause the rocket to arc over. Going by the cutout method, you're going to build a rocket with a much longer lever than you think. You might think you have a 1.5 caliber static margin, but it may in fact be 3 or 4 caliber. You're giving the wind a much easier task of weathercocking the rocket. And of course, a rocket which expends all its energy in going straight up is going to reach a much higher altitude than one which arcs over into the wind. Note: While weathercocking is normal in rockets, sometimes it's bad enough that it can be a little scary. The first time I flew my Estes Big Bertha, I was unfamiliar with this concept. The Bertha has very large fins, and it was a pretty windy day. The rocket flew almost horizontally before taking a nose dive - straight at a dog park! Fortunately, the chute opened at the last minute, and the rocket drifted back to the field. The Bertha is pretty lightweight, and I actually don't think there were any dogs at the park at the time, so it was probably not a dangerous situation - but it certainly scared me at the time! I enjoy looking back at that video now, because my reaction was pretty funny, but I've never posted it online, because in my panic, I used a lot of language. We'll talk more about weathercocking and how to minimize it in an upcoming post. With these limitations, it was clear we needed a better method of reliably finding the CP on a rocket design before building. For competition modelers, this was vital. One particular section of the National Association of Rocketry - NARHAMS, of Maryland - had a lot of competitive rocketeers. They also had one huge advantage - a particular club member they could turn to to ask for help. His name was James S. Barrowman. 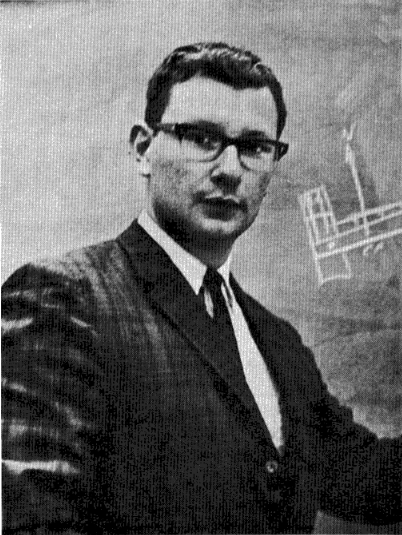 Not only was he a member of the National Association of Rocketry, he also happened to work for NASA, with the sounding rocket program. Perhaps he would be able to help. We'll talk more about James Barrowman and his solution in the next post.